On my last trip to Brazos Bend State Park, Doug and I didn’t have much luck with birds until we came across this Great Blue Heron that allowed us to get very close. Too close to get anything but head shots, which is not a bad situation to be in. When that’s the case with long necked birds, it’s time to go vertical. Got some photos as he was facing us but kind of liked these POV shots as he was looking away. Somehow in the move to a vertical shot, ended up moving the dial by mistake and got -2/3 exposure compensation. I’m still not used to having the exposure compensation bar on the right side of the viewfinder compared to my 7D with the bar on the bottom. 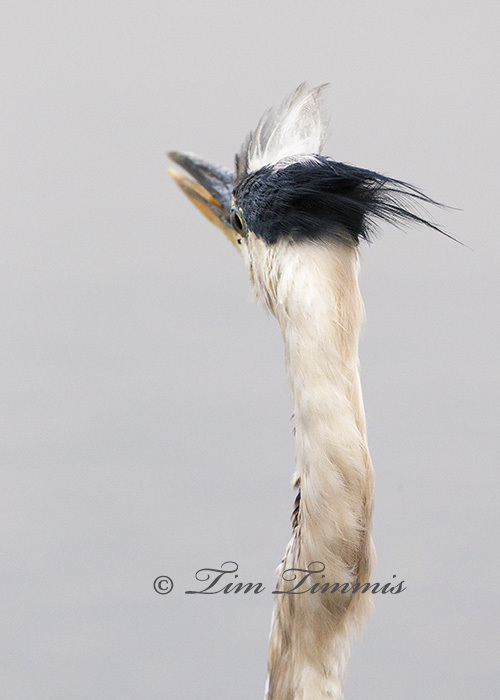 This entry was posted on July 27, 2014 by Tim Timmis. It was filed under Birds and was tagged with Brazos Bend State Park, Canon 1.4x III, Canon 1DX, Canon 500mm F4 IS II, Great Blue Heron, Wimberley II. You just made a long neck seem remarkably long. Great perspective. Thanks Lyle. He made up for a very slow day.